The analysis and control of tone resolution characteristics should pay attention to two issues, first, the understanding of tone characteristics; second, the determination of ideal tone levels and the measurement and control of tone increments. That is, the maximum dot area of â€‹â€‹175 lines/inch is formed by exposure of 256 laser beams with 16 rows and 16 columns. After the amplitude modulation network has set the number of screen lines and screen angles, the maximum screen area and the center position of the screen are determined. In the determined screen area, there is only one network point. Dots increase from small to small in the center of the area, and the tone is shallow to deep. At present, the original electronic document pixel has 8 bytes of 256 bits for each primary color, representing a 256-tone tone. Therefore, when the 175 lines/inch screen is screened, the imager's laser accuracy should not be less than 2800 dpi. In high-definition screening, the imager's laser accuracy should be set higher. For example, 350 lines/inch screening, the ideal laser precision should be 5600 dpi. However, if the above requirements are not met in actual production, the visual clarity of the printed matter will be higher than 175 lines/inch. In the 175-line/inch maximum dot area, four 350-line/inch dots can be distributed. If 2800dpi output is still applied, each dot has a tone number of 64, and all four dots have 64*4= 256. The visual clarity of the printed image was 350 lines/inch for 4 x 256 = 1024,175 lines/inch for 1 x 256 = 256. It can be seen that the 350 lines/inch resolution is 4 times higher than the 175 lines/inch. If the laser accuracy is increased to 4000 dpi, the equivalent tone scale of 350 lines/inch can reach 522, and the 175 lines/inch is still 256 due to the limitation of the original electronic data tone progression. Under this condition, the image sharpness was printed, 350 lines/inch was 4Ã—522=2088, 175 lines/inch was 1Ã—256=256, and the line resolution of 350 lines/inch was increased by 8 times. If the original image has an accuracy of 350 dpi and is output at 175 lines per inch, the basic screening algorithm is to copy every 4 pixels in the image to correspond to one dot. The average of 4 pixel tones determines the tone value of the corresponding dot. The difference between the four pixel tone values â€‹â€‹cannot be expressed in the dot tone value. This is one of the main reasons that the AM screen prints do not look as delicate and soft as the original. If the image with the same precision is replaced with 350 lines/inch screen output film, each pixel can be copied by one dot. In the area where the original color tone changes significantly, the accuracy of tone reproduction will make the color of the printed picture more delicate and soft. . Under normal circumstances, the number of high-definition dottone tones should not be lower than 128. When the conditions permit, it should strive to reach 256, to avoid the image tone being over-compressed and graded during screen output. The image clarity of the FM network. The 2Ã—2 tuning dots under 2540dpi laser accuracy, dot width of 20Î¼m, can be arranged in a 350 line/inch dot area approximately 4Ã—4=16 dots. In an FM network, the position of the dot is fixed in the area set by the dot algorithm, so the number of equivalent tone levels is 16, which is the same as the dot number. The clarity of the printed image is 16Ã—16=256 for the 2Ã—2 frequency modulation network, and 1Ã—54=54 for the 350 line/inch amplitude modulation network. If the 350 line/inch amplitude modulation network uses 4000 dpi laser precision, the number of tone levels is 1 x 130 = 130. In contrast, the visual clarity of the 2 x 2 frequency network image is nearly 1 times higher. If you use an FM network dot with a width of 10 microns, the visual clarity of the image is 49 x 49 = 2401, which is about 18 times higher than 350 lines/inch. From the above analysis, it can be seen that the high-definition amplitude modulation network depends on the improvement of the imager's laser accuracy, and the resolution of the tone is mainly used to improve the visual clarity of the printed image. The FM network can improve the visual clarity of the printed image mainly by improving the spatial resolution under the condition of lower laser precision. However, due to the effect of the screening algorithm, in the first-order FM network prints, due to the uneven distribution of the dots, the color coarseness is noticeable in the bright-tuned area, and in the bright-toned area, the â€œfreckleâ€ caused by the non-simultaneous connection of the dots. Increased visual roughness of prints. The location of secondary FM network sites is affected by the number of outlets in the reference area set by the network point algorithm. The layout of outlets tends to be even and uniform. In this sense, although the tone resolution and spatial resolution of the tone are the same as those of the primary frequency modulation network, the distribution of dots is more reasonable, and the roughness caused by â€œfreckleâ€ can be significantly reduced, so the visual clarity of the printed image is higher. Controlling the quality of image printing is essentially controlling the printing quality of printed-site Internet sites, studying the causes and laws of network changes, and providing the basis for printing quality control. The area of â€‹â€‹the film web site will change differently when it is sunk onto the PS plate and the ink is transferred onto the substrate. When the film is printed, the optical diffusion and diffuse reflection of the PS plate will reduce the width of the finest layer on the plate so that the dot area on the plate is smaller than the dot area on the film. 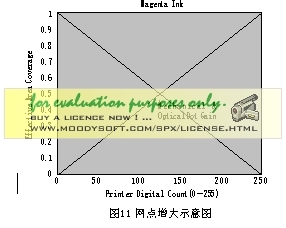 The reduction in tone value is related to the parameters of the printing process. Under the same conditions, the decrease in the tone value is approximately proportional to the number of screen lines. The ink on the plate is transferred to the surface of the substrate under the pressure of the printing. The pressure of the ink under the influence of the network will expand around the point, the greater the pressure, the more powerful expansion. Experiments have shown that, under the same process conditions, the increase in print level adjustments is approximately proportional to the number of screen lines, and the expanded width of halftone dots with the same area of â€‹â€‹screen lines is approximately equal. Under normal circumstances, the different printing screens of different amplitude modulation screen points will exhibit different printing tone characteristics (see Figure 11). For FM sites, the amount of area change caused by printing and printing is a function of the sum of the side lengths of the outlets. The total length of the bank's side lengths is related to the location of the outlets, in addition to the outlets themselves. Using different dot algorithm, the splicing situation of the dot will be different, and the characteristic curve of the increment tone value will be different. The output of the film is based on a 37-step web foot ladder electronic file. The area of â€‹â€‹the ladder foot is set to be 0% to 10% and 90% to 100% in increments of 1% and between 10% to 90% in increments of 5%. Film fogging and exposure density should meet the standards, dot area deviation should be within the specified range, and dot edge width should meet the requirements. The value of the dot value measured on the film was used as a benchmark for comparing changes in the tone values â€‹â€‹of printing and printing dots. It should be noted that the dot area measured using a transmission densitometer is actually calculated from the measured density value. The incident light emitted by the light source is absorbed excessively at the edges of the dots. Therefore, the density value received by the detector is larger than the theoretically calculated value. Therefore, the calculated dot area value is certainly larger than the actual area value. The greater the sum of the side lengths, the greater the deviation between the two. When applying high-resolution dots, it is necessary to make up for the actual dot area deviation of the film affected by the densitometer measurement. There are two ways to solve the problem. One is to use an instrument for calculating the dot area by photographic means, such as a PS version. Second, use the Yule Nielsen formula instead of the Marley Davis formula to calculate the measured density value. Dot area. In order to calculate the actual area of â€‹â€‹the film web site, and to measure the density of the film space, the density of the field, and the dot density together, the correction factor in the Yule Nielsen formula is calculated in advance using a PS plate measurer or other image analysis microscope camera. n. From now on, the relative density can be directly measured, and the area of â€‹â€‹the dot is calculated using the Yule Nielsen formula with n coefficients. Different number of screens, different values â€‹â€‹of n.
After the actual dot area on the film is determined, print, print, and measure the corresponding change in dot area. The general operation and quality inspection of these processes shall be in accordance with GB/T 17934.1/2-1999 "Printing Technology Mesh, Color Processing, Proofing, and Process Control of Finished Products" series of standards, GB/T 18722-2002 "Printing Technology Reflections." Application of Density and Chromaticity Measurements in the Control of Printing Processes and CY/T 30-1999 "Printed Plate Making". As mentioned above, the printing and printing processes change the area of â€‹â€‹the dot, and the size of the change is related to the number of lines of the screen, that is, the sum of the lengths of the sides of the dots. High-resolution dots and print tone curves are easily obtained by applying the above method. The tone curve of each type of screen or FM network may be different, and the corresponding difference should be analyzed based on the 175 line/inch tone curve. Can be found in the existing process control methods and combined into suitable sets of technologies, so that high-definition printing technology can be in the company's existing equipment and materials, to achieve stable production applications. In high-definition printing products, the images look clearer, softer, and softer, and the printing color tone characteristics are closer to the originals, and there will be no situation of excessive loss of brightness adjustment, too boring tone, and dark shadows. Strictly speaking, high-definition printing technology does not belong to the revolution of printing technology, but the integration of existing process equipment and technology. Its application is necessary to provide new weapons for fierce market competition. At the same time, the improvement of the performance of contemporary printing equipment and materials has provided necessary conditions for the application of high-definition printing technology, and it should not stick to the conventions and waste the potential of these resources. In addition, high-definition printing technology and high-fidelity color printing technology applied at the same time, will be a perfect match, the icing on the cake, so that printed products have a new look and value. The visual clarity of a printed image can be thought of as the product of spatial resolution and tone resolution.